Wednesdays 1pm-4pm OR Thursdays from 10am -1pm on alternating weeks. Please refer to brochure for times each week as there are two groups to choose from. Art Group for budding and experienced artists in the community who are keen to join us for painting, coffee and fun. 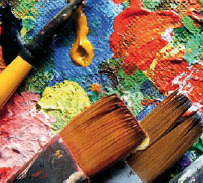 There will be an art teacher in attendance who will give structured lessons on the various art techniques and mediums.